So this is part recipe and part inspiration, since you can use it as a base to make your own recipe, hence the title “food inspo”. This is the second addition of food inspo, if you want to find out how I turned soup into gluten free flatbread/pancakes you can press this link. 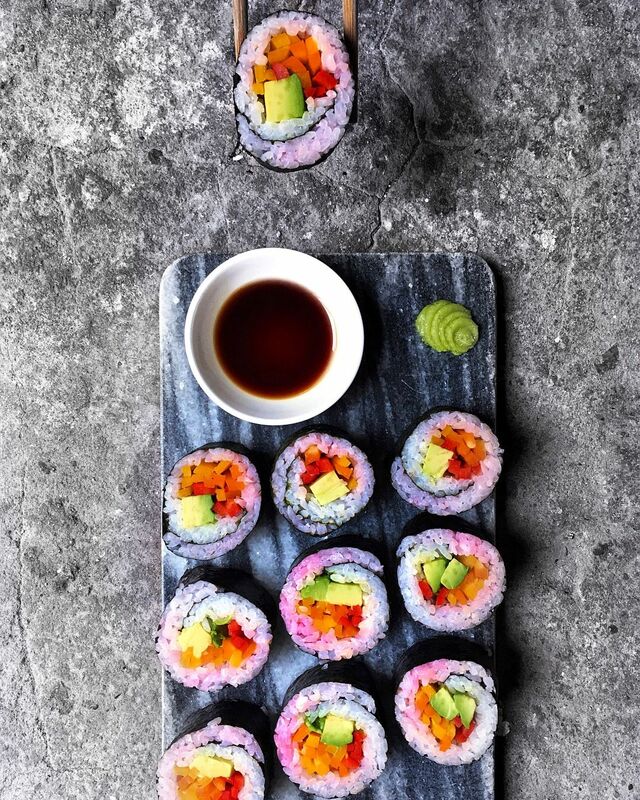 Now this might seem like it’s going to take a whole day to create, but don’t worry whenever I’m feeling extra I make myself some of these rolls in under and hour. And when you prep the rice in advance you’ll be left with a 15 minutes meal. 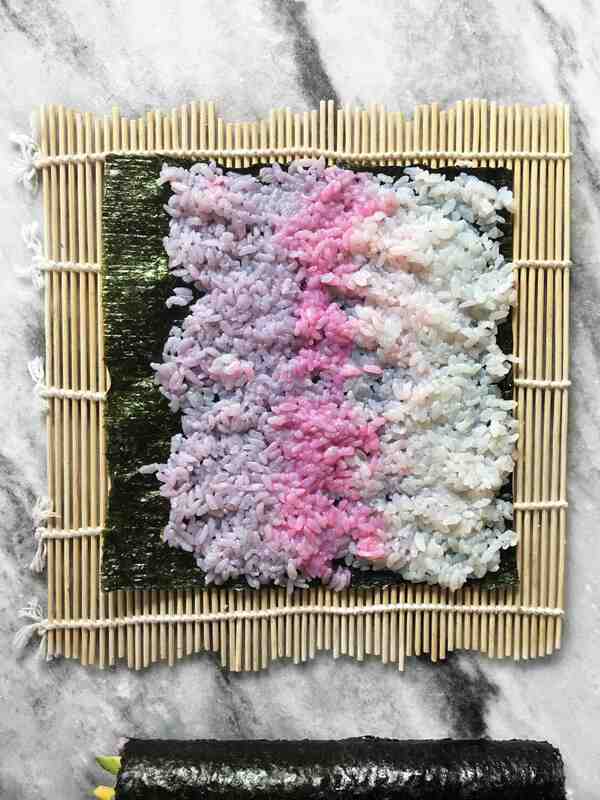 You can find a whole post explaining the unicorn rice over here, and while you’re at it why not try to make some unicorn noodles? Add some magic to your lives! How to make the rolls. For this recipe I’m using two cups of uncooked rice, so I’m immediately prepping some rice for days ahead. While you’re preparing the cooking water you can start washing the rice. Wash and rinse until the water becomes clear. Start by adding about 4 cups of water to a pan and adding a chunk of purple cabbage and turning on the heat to medium/low until the cabbage has turned the water a deep blue colour. Remove about 1 1/4 cup of water from the pot and add another little chunk of purple cabbage to the water to create an even deeper and more concentrated colour. Let it simmer until it looks deep purple. Now you’ll be left with two different shades of water. Separate the rice over two pots and add the light shade to one pot and the darker to the other pot of rice. Turn the heat to the lowest heat possible and let it simmer for about 25 minutes. Using this low heat will ensure the colour doesn’t go from lilac/blue to brown. 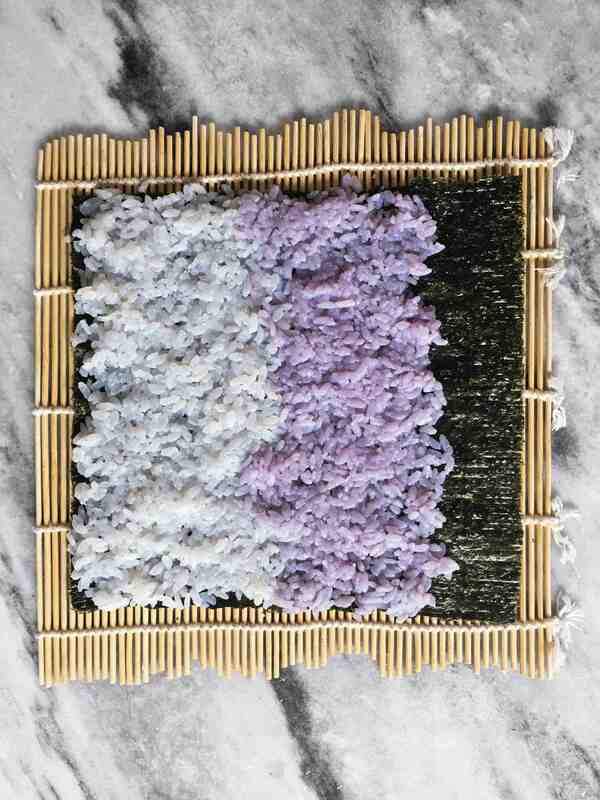 When the rice is done remove it from the pots to let it cool before placing on the nori sheets. 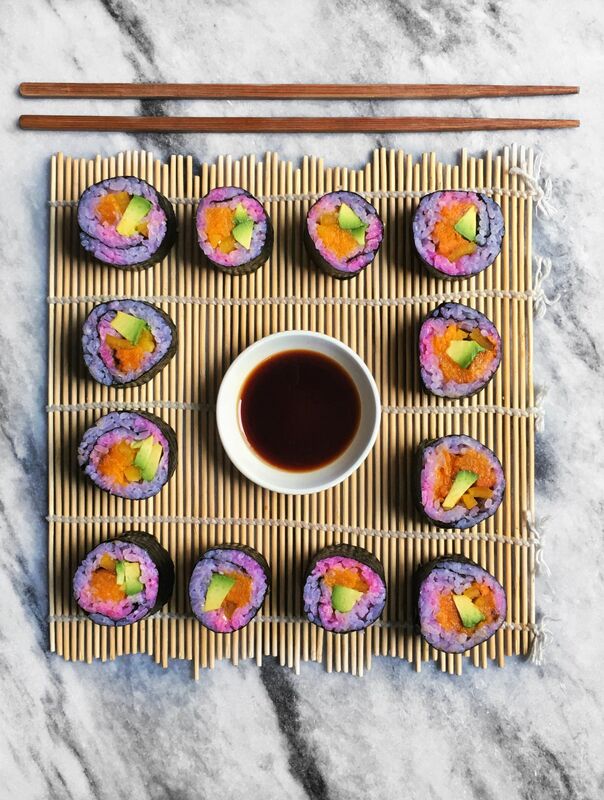 Once you’ve placed it on the nori you can squeeze some lime or lemon on the spots you’d like to transform the colour of. 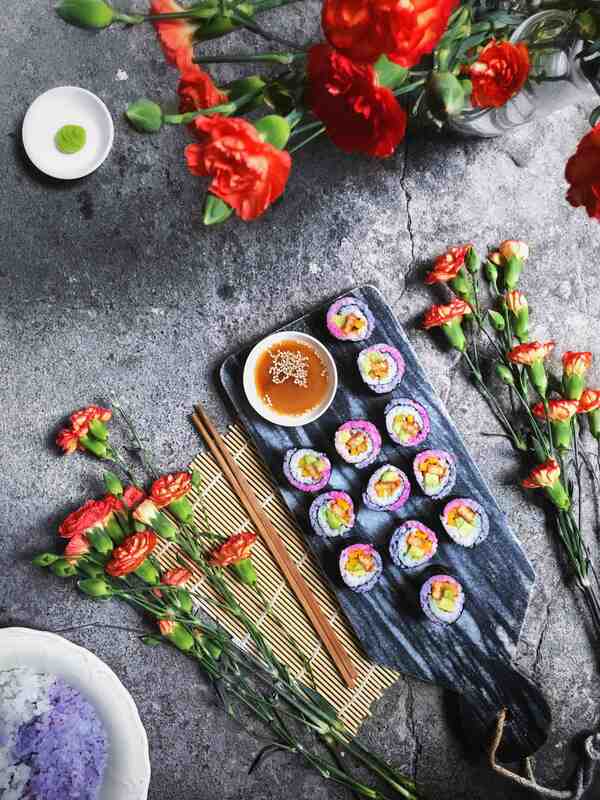 Roll the maki, cut it and voila, you’ve become a magician. Note that the rice that got the acid keeps getting brighter so when you cut it you might be surprised to find it became a bit brighter! 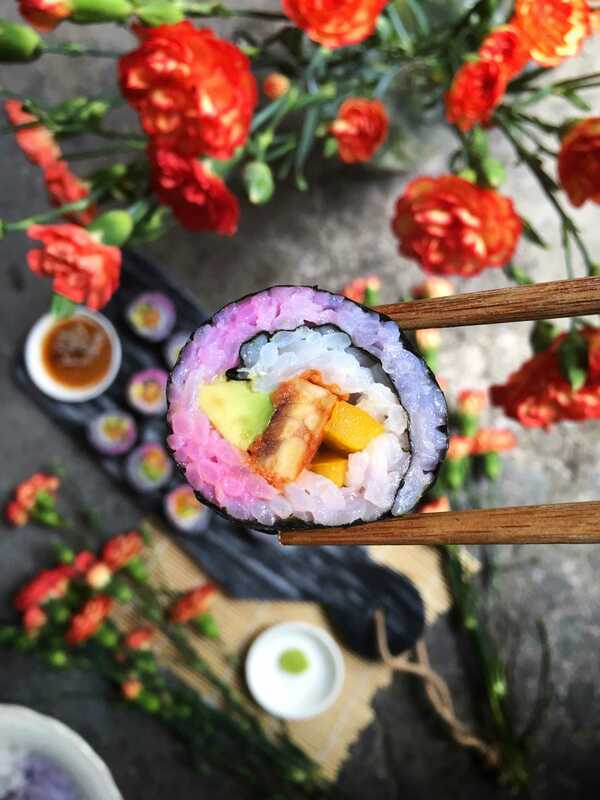 Now you can fill these rolls with whatever you like, throughout this post you can find some different variations. You can try adding some sweet potato, or maybe you’re into some savoury strips of tempeh! Regardless of what ingredients I add, I always add avocado! Let me know if you like posts like these in the comments below and if you decide to make some magical unicorn rolls don’t forget to tag me in your creations on Instagram cause I’d love to see what you made, or find me on Facebook!